Never anywhere this price before, and still £265 at John Lewis. Solid and stylish pans for a premium cooking experienceWe’ve combined Jamie’s cooking talent with Tefal’s expertise to give you a premium cooking experience. 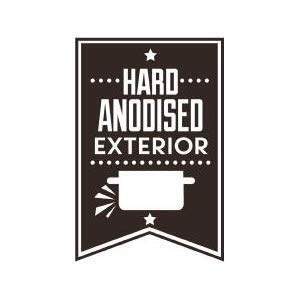 Introducing the Jamie Oliver Hard Anodised cookware range by Tefal: the solid, yet stylish, cookware range. Hard anodised aluminium makes the exterior of these pans incredibly durable – not to mention, it gives them beautiful brushed black finish. Meanwhile, the titanium-coated interior provides extra scratch-resistance and crispy results, every time you cook. What’s more, every frying pan includes our iconic Thermo-Spot; this clever heat indicator turns solid red when your pan has reached the ideal cooking temperature for precise cooking. Plus, the range is compatible with all hobs (including induction), oven safe (up to 210 degree Celsius) and dishwasher friendly. Go on – raise your cooking game with this premium cookware range. Hard-wearing. Easy on the eyeBuilt to last, this robust range is forged from aluminium treated with an electrochemical process, giving the pots and pans a beautiful brushed black finish that will look the part in any style of kitchen. But don’t let the stunning good looks fool you. This hard anodised exterior is incredibly resilient, so you can rely on these pans time and time again. What’s more, these tough pans have solid aluminium cores, providing excellent heat distribution (no ‘hot spots’) for evenly cooked results, every time. 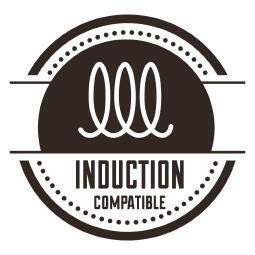 Expert cooking made easyPreheating your pan is the key to exceptional cooking. But how do you know when your pan is heated to just the right temperature? With the Thermo-Spot heat indicator! 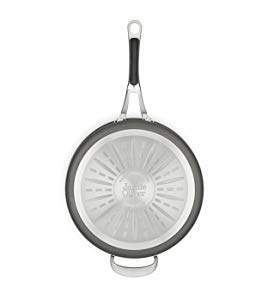 You’ll find Thermo-Spot on the surface of every Jamie Oliver Hard Anodised Ceramic frying pan. Once the spot turns solid red, you know the pan has reached the ideal cooking temperature (180-200C) and it’s time to add your ingredients. No more guesswork – and no more under or overcooked food! Clever coatingsBeautifully crisp resultsAll Jamie Oliver Hard Anodised pots and pans feature a titanium-coated interior. 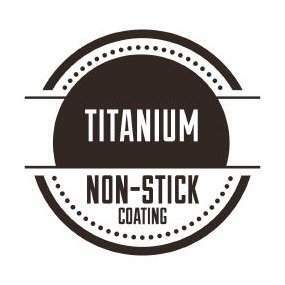 Why titanium? For starters, it’s non-stick and incredibly resistant to abrasions. Rest assured your food won’t stick and your pans won’t scratch – even when using metal utensils. A titanium interior also provides the ideal surface for searing meats, fish and vegetables. It’s the effortless way to achieve beautifully crisp results. Top tip: add a little oil to the pan and you’ll be searing like a chef. Did we mention they’re a breeze to wipe clean too? Or save yourself a job – they’re dishwasher friendly. Secure and comfortableJamie Oliver Hard Anodised pots and pans feature riveted stainless-steel handles with a silicone grip underneath for secure and comfortable everyday use. Multi-hob compatibleA stainless-steel disc on the base of these pans makes the Jamie Oliver Hard Anodised range induction compatible, as well as suitable for use on gas, electric, ceramic and halogen hobs. 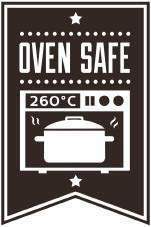 Oven safeThe Jamie Oliver Hard Anodised cookware range is oven safe up to 210°C, including grill function. So, you can start dishes on the hob and finish them in the oven. I ordered these the last time they were on offer. I have to say they were lousy. Handles were secured by one screw and would often work loose and on one occasion the handle snapped off and luckily the veg and water were lukewarm and not boiling. A would consider these (if they are the same) a danger hazard. I ordered these the last time they were on offer. I have to say they were …I ordered these the last time they were on offer. I have to say they were lousy. Handles were secured by one screw and would often work loose and on one occasion the handle snapped off and luckily the veg and water were lukewarm and not boiling. A would consider these (if they are the same) a danger hazard. Fortunately, these aren't the same ones that you mention. You'll see from the reviews on Amazon and on John Lewis that they're very well constructed, and that the handles certainly aren't secured by one screw.